Many many moons ago I first gave the recipe out to my Goddaughter in Atlanta, after she exclaimed it was the best Caesar salad she’s ever tasted. (I hear that a lot!) Years later I go to her Mom’s for dinner (in Mississauga) and they have Caesar salad on the table. I said “This tastes familiar.” I’m told “It’s Tera’s recipe, would you like us to give it to you?” I told them “No, it’s ok thanks. I can figure out what’s in it!” Lol. I did eventually tell them that it was actually me who gave it to her, but they looked at me suspiciously anyway. Ok. So it went to the USA and back. But then…. Another couple of years go by. And I’m at a friends for dinner. Can you guess? They were serving Caesar salad. And it was my recipe. Totally unrelated people to my Goddaughter. I’d say they were as far apart as six degrees of separation. We weren’t able to trace it back to any of the other multiples of salad lovers I have shared the recipe with so it remains a mystery how it has travelled. But suffice it to say that whenever someone serves it they are probably asked for the recipe. (It’s that good) And that’s how I think it has travelled around the world. Well, at least once. Heat oven to 400F. To make the croutons place the bread in a large bowl and drizzle with the olive oil. Toss with the salt and pepper until bread is well coated. Spread out the bread cubes on a rimmed baking sheet and bake for 10 minutes or until golden. Line the baking sheet with parchment paper to save yourself cleaning the pan. Prepare the dressing by mixing the oil, lemon juice, garlic, Dijon, anchovy paste, Worcestershire sauce and lemon rind in a jar or bowl. Shake it hard if in a jar, or whisk it well if you are using a bowl. Mix in the finely grated Parmigiano-Reggiano cheese. If not using right away, cover and refrigerate. The dressing will keep well in the fridge for a couple of days. To prepare the salad wash the romaine well and spin in a salad spinner if you have one. Break the lettuce into bite size pieces and roll tightly in paper towel to dry even more. TIP: the key to EVERY good salad is bone dry lettuce. The dressing will stick to it. Watery lettuce means watered down dressing. And after all your efforts you don’t want that. 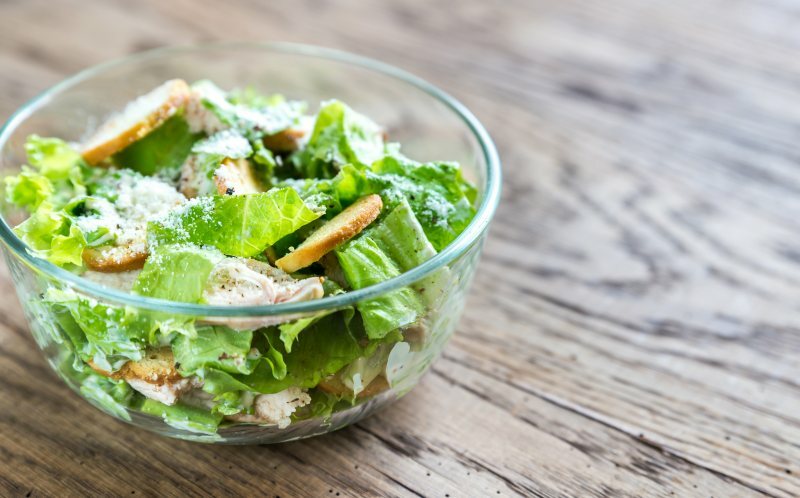 Put the lettuce in a salad bowl and toss with some, not necessarily all, of the salad dressing. It depends on how big the head of lettuce is. The key is not to overdress! No one likes a soggy salad. Add the croutons and toss again. Sprinkle with the coarsely grated Parmigiano-Reggiano cheese. Toss one more time and watch the delight of your family and friends as they savour the bright, lively flavours. Next Article » Llamas On A Sheep Farm? You Bet!